. : S.R.B.É.O. - K.B.G.O.S. 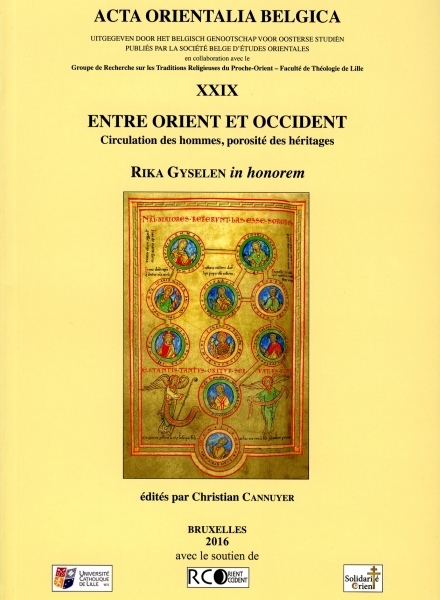 :: Acta Orientalia Belgica - Volume XXIX :. ENTRE ORIENT ET OCCIDENT. Circulation des hommes, porosité des héritages. Généalogie fabuleuse de saint Servais de Tongres, illustrant sa parenté proche avec le Christ (Bibl. municipale de Valenciennes, ms. 514, f° 89v). Vous pouvez commander ce volume en envoyant un e-mail à Christian CANNUYER. Vous pouvez également commander par courrier postal. Abstract : Our knowledge of the political and administrative functioning of the sasanian empire has been immensely improved in the last four decades thanks to the in-depth studies of the coins and the seals and bullae’s collections kept in the museums and from a few series of documents retrieved from archaeological excavations. as a counterpart, the other archaeological data are rather poor due to the dearth of the excavations. Moreover the fieldwork has long focused on certain sites amongst which only some of them have provided coins or bullae. the situation is positively changing nowadays thanks to a new research strategy in Iran, including much salvage excavations. One can expect more accurate maps of the important or medium size sasanian sites to better correspond to the actual distribution of the administrative and economic centres of that period. Abstract : In the art of pre-islamic iran we have evidence of relief busts in stucco for which a particular position on top of a semi-column can be reconstructed; at the same time we have a few specimens of sculptural human heads in the round, the lower part of which suggests a joint with an element other than the body of a statue. After describing the evidence on the basis of the available publications, the author attempts an interpretation based on the physical features of these busts or heads. This leads him to suggest the existence of a new type of architectural sculpture, the “bust-pillar”, which seems to be solely present in the architecture of iran during the Arsacid and sasanian periods. Abstract : The revāyāts, epistolary exchanges that zoroastrian from India and Iran have sent to one another between the 15th and the 18th centuries, were apparently aimed at levelled ritual and practical disparities between the two communities on the Iranian traditional model. nevertheless, this business of reconciliation failed due to a major problem: the question of the intercalation in the mazdean calendar. This critical issue for this sacrificial cult based on a temporal philosophy still exists today but we know little about the circumstances of its genesis. The revāyāt whose original translation is proposed in this paper provides answers to this question and gives a central place to the astronomical argument and the astrological theories arising therefrom. Abstract : To speak about the Persians hasn’t been a simple and easy task for the Greek Historians. Maybe the period of the Great War between Greeks and Persians was to close to the moment they began to write about this conflict. They honestly did their job to bring light on the events whatever side they came, attackers or defenders. The great challenge was they were absolutely not sure if and how the Greek readers were able to be confronted with the True or to agree to remind this very sad period of disaster. They had to pass out carefully the obstacle of the immediate proudness of the Greeks and to expose the Persian side without risking a reject. Long after the conflict, time has come to start a new approach, far less aggressive. The philosophers turned to account this period to propose a knowledge of the Persian world and its components. Their genius was to underline the high degree of the Persian culture through some matters, like religion and political affairs which could meet the interest of the Greeks. The Persian Tales could once again interest the curiosity of the Greeks. Abstract : Description of the egyptian, Julian and Gregorian calendars, of their systems and their filiation. Abstract : This article deals with the eventful history of the so-called Leopold ii Papyrus (now in royal Museums of art and history, Brussels), from the moment when it was written (during the Year 16 of ramses ix) until the moment when its historical importance was recognized by Jean Capart who identified this papyrus-sheat as the missing upper part of the amherst Papyrus (in 1935). Abstract : In this short contribution the reader will find an approach relating to the presence of luwian (and perhaps hittite) populations in West Anatolia and their moving forward to islands of the east Aegean Sea (Lesbos, for exemple). An Anatolian presence will be observed in Creta, such as in Greece. An approach of the luwian presence in the famous city Troia is also evoked. Abstract : Crete is one of the areas of Greece where the contacts with the east started again most precociously after the end of the Mycenaean period. The first levantine traces go back to 10th c., even a little earlier at kommos. Three categories of evidence in particular illustrate the contacts of crete with the levant in the early first millennium: objects, funeral rites and architecture. This article analyses the evidence and attempts to determine the cases of eastern influences and of presence of levantines on the island. Abstract : Many studies have discussed Mycenaean nouns related to occupations. unfortunately, these studies have not been able to solve all the problems caused by this category of term. Among them is the pe-re-ku-ta, which appears in one tablet (Py An 172) and is etymologically unclear. Two possible interpretations have been suggested concerning this noun. According to them, this word would belong to the family of πέλεκυς or πρεσβύτης, but none of these hypotheses are fully satisfactory. This paper offers a review of these interpretations, taking into account morphological and etymological evidences. Abstract : Greece, a crossroad between what are considered the Western and eastern worlds, often forces scholars to revise methodologies when comparison with other cultures is concerned. This contribution uses the bending of the bow by odysseus and other narrative structures (1. Draupadī’s svayaṃvara in the Mahābhārata ; 2. Sītā’s in the Rāmāyaṇa ; 3. Hittite Paskuwatti’s ritual against sexual impotence; 4. the Ugaritic legend of aqhat) to review the two tendencies in comparatism, i.e. traditional indo-european comparatism and contacts between greece and the eastern World. Even though they are artificially opposed in scholarly literature, both reveal to be complementary in order to fully encompass the complexity and depth of a particular cultural domain. Abstract : The paper brings forward a list of 74 foreigners, mainly Buddhist monks who emigrated from the West (India, Central Asia, Sogdiana etc.) into China from 150 up to 550 Ce and took part in the translation of the Buddhist Scriptures. They are known through the colophons of the Chinese manuscripts that contain plenty of information about their life and their works. The translations of their names into Chinese can also throw some light on their birthplace. A number of extra questions are dealt with : how did they reach China? Where did they live and work in their new homeland. Did all of them know the Chinese language and how did they learn it? What was the proceeding of a translation session? And finally a short list of the most popular Buddhist treatises in translation is supplied. Abstract : Many traditions from the Middle Ages claimed that Armenian saints had evangelized Europe. So, according to a local legend, st. Servatius, the first bishop of Tongeren (Belgium), was a native of Armenia. Servatius certainly existed and was a strong supporter of Athanasius of Alexandria against the Arians in the 4th century. But the traditions alledging that he was a native of Armenia - and, moreover, a close relative of Christ! – have been forged gradually, from the 9th to the 11th century. They are only inconsistent fables, although some Armenian scholars now want to defend their historicity. Abstract : The biographical information about Plato transmitted in Arabic is mainly taken from Greek sources. The most extended account is provided by Ibn al-Qifṭī. It shares many details with Diogenes Laertius, although there are significant differences proving that the muslim historian of philosophy used another source, manifestly translated from Greek into Arabic. It has been suggested that it was theon of Smyrna’s lost introduction to the dialogues of Plato. As often, the Arabic translator eliminated most of the references to ancient paganism and introduced islamic terms and concepts. He stressed Plato’s virtue and wisdom, along with his ascetic and spiritual life. In some cases, the Arabic lives of plato are followed by a collection of sentences attributed to the philosopher. They complete the image of an ascetic and mystical plato, close to sufism. Hence, Plato was adopted by islamic mystical orders as a chain in the transmission of wisdom. Abstract : A payment of 1426 in the general Receipt of the Finances of Burgundy relating to a "voyage secret" and a pilgrimage by Jan Van Eyck has aroused numerous assumptions. Did Jan Van Eyck go at that time to Aragon or to italy ? Could it be that he pursued until the Holy Land ? If the documents are not enough to provide a final answer to this question, the works too have things to say. Some Eyckian panels depicting episodes of the Passion of Christ show in the backround an urban view of Jerusalem. The Three Marys at the Tomb at Rotterdam with its representation of the holy temple stemming from the model of the Dome of the Rock is particularly suggestive. Other buildings in this view suggest indeed connections with buildings of the biblical times. Do these topographical observations speak in favour of a stay of Van Eyck in Jerusalem ? Do they derive more probably from a litterary source, an ancient description of Jerusalem as this which gives away Flavius Josephe in his Jewish War ? Abstract : Jan Van Eyck has been a servant, close collaborator and official painter of the duke of Burgundy Philip the Good. As his ambassador, he travelled to Portugal and probably to Jerusalem in order to prepare for a Crusade. This project is the original subject of a series of paintings and, for instance, of the famous Ghent altarpiece, the Lamb of God. Abstract : This article is about the journey of the Ottoman Sultan Abdülaziz in Paris in 1867, on the occasion of the universal exhibition. This report uses the diplomatic archives, some newspapers and a few memoirs written by witnesses of the event. This journey was followed by an official visit to Queen Victoria in Britain. The event is seen in the international context of the time. Its very limited impact on the internal development of the policy of the Ottoman Empire is studied. Abstract : The previous mythology, that provided the essential support for the cosmogony in the traditional Egyptology, has been abandoned in favor of a unique design : the god Aten. The hymns constitute an essential source to understand the history of this period and particularly the religion. The return to the Little Hymn will notably allow a decision on the discourse of an alleged monotheism inherited by the Aten religion. Along this idea, the selected extract reveals the special relationship between Akhenaten and his god, the solar globe Aten. Finally, analogies between Amun’s hymns of the 18th dynasty and Aten’s hymns propose the question - which will not be discussed in this article – if the world of the night and the beyond in the amarna theology, has been annihilated even though others have an antithetic view on that question. However, it will be an opportunity to address one of the main themes of the Aten’s hymns:the creation. Abstract : This article carries essentially about the xéniteia, the asceticism and the "foreign" term in the monastic approach. The example of the Life of Onnophrius/Mission of Paphnutius is exploited. Copyright © 2006 - 2019 S.R.B.É.O. - K.B.G.O.S.